Join this team of climbers on their extraordinary trip of a lifetime as they trek two different worlds; the fascinating and spiritual country of Bhutan and the famous mountain ranges of the Khumbu Valley. We begin our adventure in Bhutan. With its unsurpassed natural beauty this country will give our team an unforgettable journey. Each day will be filled with unforgettable mountain views and pristine Himalayan culture. The trek will begin at the famous Bhutanese monument, the Drugel Dzong, located in the Paro Valley. From there we will trek along the Paro Chhu River through villages, rice terraces and filed of millet. As we continue on we will come across stunning views of Chomolhari (23,997 ft/7,314 m). 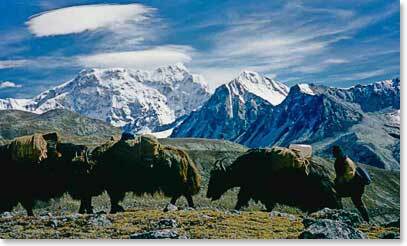 The mountain ranges in Bhutan are very similar to the ones found in Nepal, with their towering, snow-capped peaks. After Bhutan our team of climbers will head back to Kathmandu and then off through the Khumbu Valley towards Everest Base Camp; truly a one of kind trekking experience. Stay tuned as we send daily dispatches to update you on our trek and to give you a first hand look at this amazing adventure.